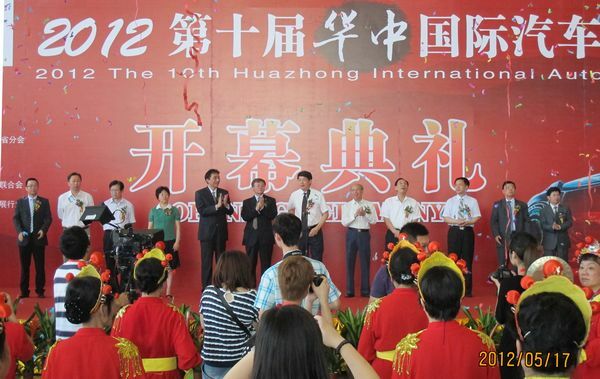 On 21st May, 2012 10th Central-China International Auto Show ended in Wuhan International Exhibition Centre, Hubei. Started on 17th May, the 5-day exhibition has attracted over 270,000 visitors, 6000 cars were sold on the field. The show upgraded on its scale, quality and provided the auto industry a better platform to promote their brand and expand the market. As the largest event in central-China auto market, Central-China International Auto Show has become one preferred platform for people from Wuhan city and around area to look for and buy cars. During the show, dozens of special offer were made by the exhibitors: gift package, free gas card, price discount etc. With the Varies promotion, new orders arrive continuously. Based on the official statistics, total sale of displayed cars has reached 6000. On 19th May Saturday, 2000 cars were sold; refresh the record of single-day sales in central-china. On the same time, over hundred mainstream media joined the reporting, over 150 print media, 600 minutes of TV coverage, 5.09 million of internet report. This represent the show has gain recognition in entire society. The show covered 5 pavilions of Wuhan International Exhibition Centre zone B, and over 50,000 sqm exhibition area, 60 brands and 600 exhibiting cars, the scale is beyond the past, and highly appreciated by the exhibitors and visitors. With free entrance, there are 7 free buses to the exhibition centre, 7000 parking space，1000 taxis provided，7 convenient shops，2000 sqm of resting and dining area，over 1000 security guards，and ambulance, fire truck awaits on site. A series of service guarantee the comfort and safety of exhibitors and visitors. Adapted to hot and lively image of Wuhan city, central-China auto show has an extremely hot luxury car pavilion, with lots of hot models and fans. Bentley Mulsanne, as the most expensive car of the show, which cost 5.68 million RMB, were sold out in just 1 hour after shown to the public, and made a new record of sales speed. Another model of Bentley- flying spur were sold right after Mulsanne, luxury car consumer group were expanded in Wuhan in recent years. During the 5 days exhibiting time, luxury car brands such as Rolls-Royce, Aston Martin, and Lamborghini all have been booked. The 10th Central-China International Auto Show provided not only a platform but also a visual feast. The heating up of Wuhan auto consumer market, promote the harmonious development of politics, economics and cultures. The show was approved by Ministry of Science and Technology of China, organized by SAE China, CADA, CNAICO, Hubei Economy and Technology Commission, CCPIT Hubei. Through the ten-years development, the show has become a well-known brand in Wuhan, as well as the wind vane in Wuhan auto market.